The sellers accepted our offer. We are truly over the moon. And to celebrate, we had a gorgeous one last night. My friend, Jewels, called me on the way to her book club to make sure that I was taking pictures of it. Taking pictures of the moon is really tough - you get quite a bit of lens flare that requires editing. I don't like to do much editing so I was pretty tickled with the outcome. 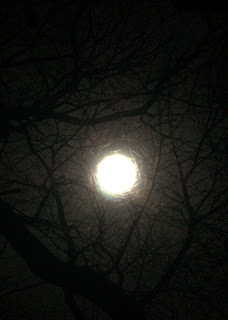 If you look closely, you can see the branches of the trees and the ice crystals around the moon. Jewels was right - the December moon is the most beautiful! Sweet!!! It was so gorgeous on my way to work this morning too that I wish I had my camera and time to shoot it. Good job Dee! I'm so excited for you and Paul! This photograph of the moon is absolutely stunning!